Tonight is Walpurgisnacht. Witches’ Night! Dedicated to our own resident witch! Mexico City – The US Navy has temporarily added a second aircraft carrier in the Gulf as a “reminder” to Iran, but this was not an escalation of American forces in the region, U.S. Defense Secretary Robert Gates said on Tuesday. Speaking to reporters during a trip to Mexico, Gates flatly denied a suggestion that the presence of two US carriers in the Gulf could be a precursor to military action against Tehran. Iran, OPEC’s second-largest producer, has stopped conducting oil transactions in U.S. dollars, a top Oil Ministry official said Wednesday, in a concerted attempt to reduce reliance on Washington at a time of tension over Tehran’s nuclear program and suspected involvement in Iraq. Oil is priced in dollars on the world market, and the currency’s depreciation has concerned producers because it has contributed to rising crude prices and eroded the value of their dollar reserves. Iranian President Mahmoud Ahmadinejad called the depreciating dollar a “worthless piece of paper” at a rare summit last year in Saudi Arabia attended by state leaders from OPEC countries. Right before we attacked Iraq, Saddam Hussein quit trading in dollars and went to Euros. After we invaded, and took out Saddam, we quietly changed it back to dollars for oil trading. What does all of this have to do with Cheney’s recent trips to the ME? Is this the ‘urgency’ and the rising BOOM BOOM BOOM of these beating war drums? In case you missed these.. 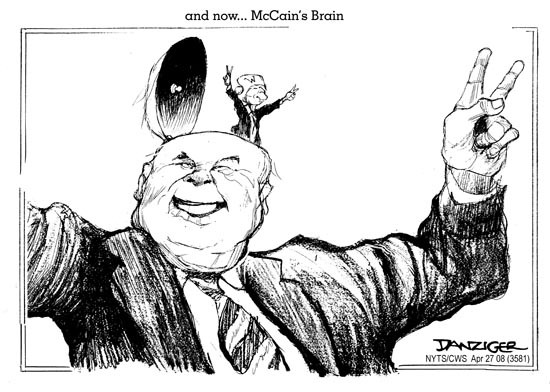 The Free Press – Did the US Supreme Court just elect John McCain? Truthout – Witness Says Hastert Linked to Alleged Plot (referring to the Rezko trial and the plot to get rid of US Attorney Patrick Fitzgerald). Is this how we support our troops..? It’s like Walter Reed all over again. The US defense budget last year was a staggering $439.3 billion dollars. Can’t we spare a few bucks to ensure our soldiers don’t have to live in such horrendous conditions? Magnetic yellow ribbons and flag lapel pins aside, “supporting the troops” means actually caring about them. Not only when they’re off fighting your wars, but also when they come back. Kudos to the understandably outraged father who exposed the story. My hands are shaking right now from the disgust and outrage I feel. This administration and our government don’t care about our soldiers, they only care about their war and the profits. That’s it. Words don’t mean anything. Actions (or INACTION) speaks far louder than words. The administration has demonstrated over and over again just where their loyalties and PRIORITIES lay. When are we going to do something to stop all this? Hold people accountable? There is just no more excuse. They don’t care. That’ the bottom line. Well, as good as nobody.. According to Mother Jones in their May-June 2008 issue, our fight for energy “independence” is a losing proposition. Here are some great stats pulled from the article “The seven Myths of Energy Independence” by Paul Roberts. I don’t necessarily agree with everything in the article, but I do agree that I don’t think the US will ever see energy “independence” in my lifetime. Some of these tables and charts show some interesting figures. Check out another informative table here. How in the heck can we expect energy change when our federal oil and gas subsidies out spend the worldwide investment in renewable energy?? ?